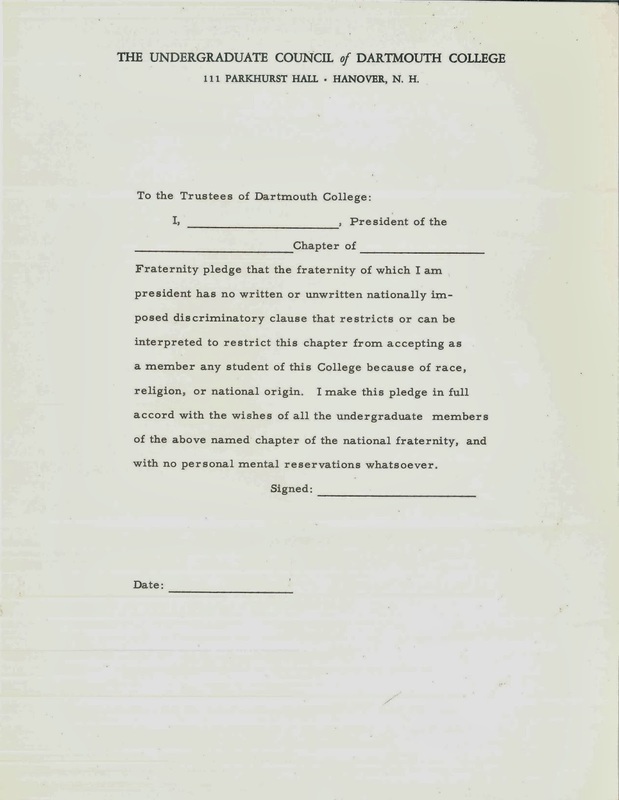 In March 1954 something rather extraordinary happened at Dartmouth. The undergraduate council, led by future Dartmouth President David McLaughlin, put before the entire student body a referendum to end discrimination in the fraternities. 86.5% of the student body voted, and the measure passed by a thin majority of just four votes. 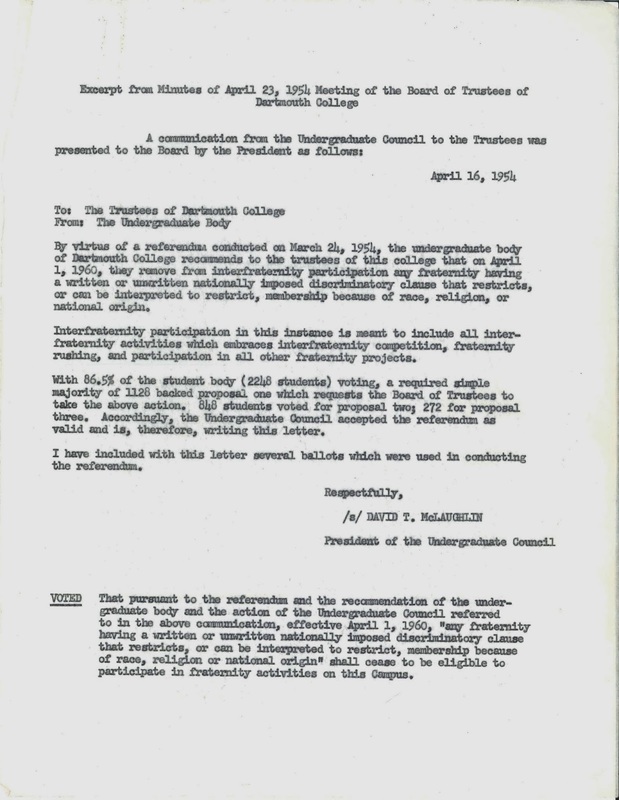 The referendum required that by April 1, 1960, "any fraternity with a written or unwritten nationally imposed discriminatory clause that restricts, or can be interpreted to restrict, membership because of race, religion or national origin shall cease to be eligible to participate in fraternity activities on this campus." In other words, fraternities could no longer blackball prospective pledges based on race, religion or nation origin. 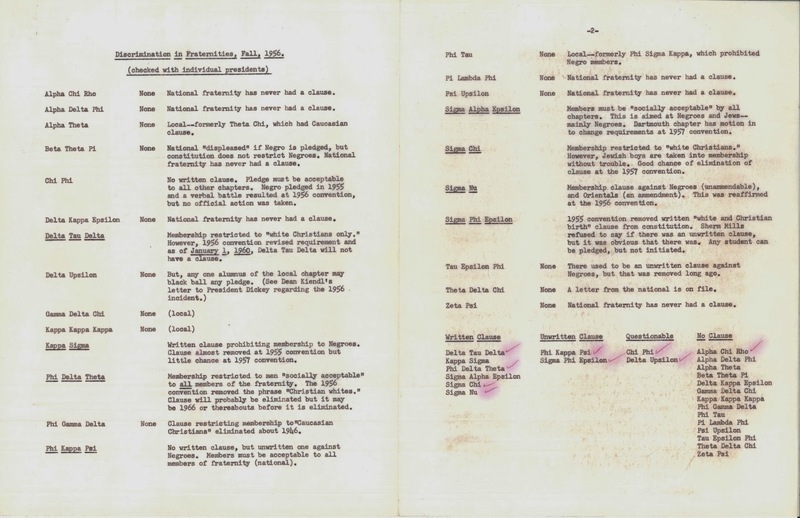 A 1956 document shows what the fraternities were up against. The national chapters of many of the organizations restricted membership to "white Christians" and even some without formal policies had unwritten understandings that had to be adhered to by the local chapters. The result of the referendum was that many fraternities broke their national affiliations and "went local." 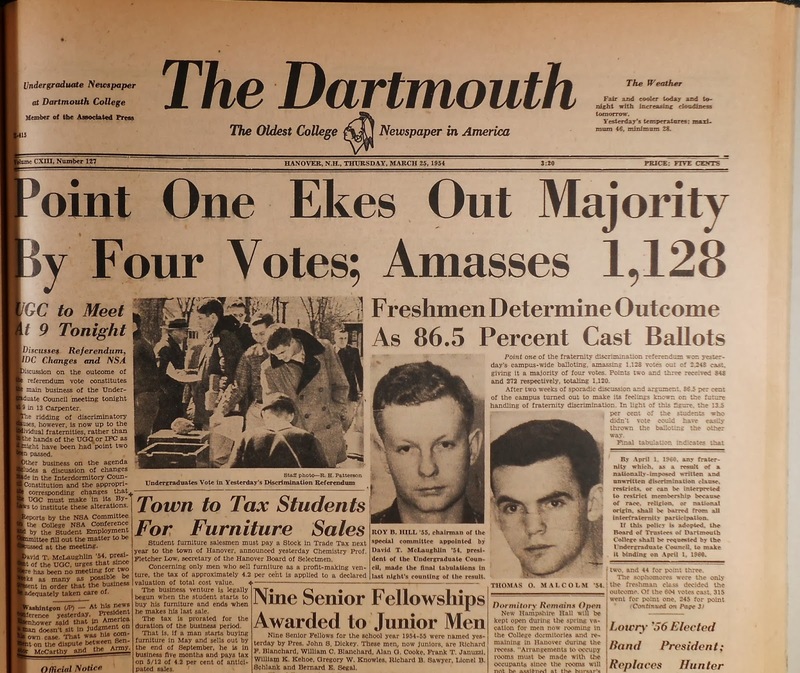 It is interesting to think that one of the driving forces that created Dartmouth's distinctive Greek system was a majority vote by students in the 1950s who were committed to equal rights for a minority population on campus. A different kind of "pledge"
In addition to documents related to the decision to end the discriminatory clauses, we have a fraternity ballot box which once could have been used to blackball a non-white or non-Christian pledge. To learn more, ask for the vertical file "Fraternities, 1950-1979."